Anne Drolet and Fredrick Hetzel, 2018 Blake W.H. Smith Scholarship awardees. Our project proposal was for an interprofessional clinic with involvement from medical students and physical therapy students. This would allow students to give back to the community while also learning more about each other’s professions. 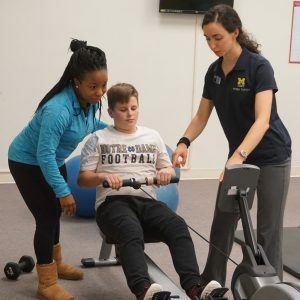 We started off our project with stakeholder buy-in from both Michigan State University College of Human Medicine and University of Michigan Flint Department of Physical Therapy. Receiving the Blake Smith Scholarship aided us in clinic planning, as it was the first source of funding that we secured to make this a reality. Our next major hurdle was securing a location to hold the clinic. 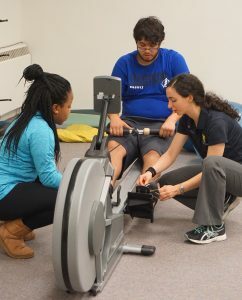 The physical therapy students have been holding a free clinic on Fridays called “PTHeart”. Unfortunately, this occurred from 12:00pm – 1:30PM, and it was not feasible for medical students to participate due to clinical responsibilities. We met with another community partner, Kris Johns, who helped introduce us to church leaders and other interested community members. After holding several meetings, we decided on partnering with the Mott Children’s Health Center. They have several large rooms as well as a gym area, which would be ideal for educational purposes. The student leaders (Drolet, Hetzel, and a third year PT student) had several meetings to plan out the structure of the event. This would be geared towards children, mainly those in middle school and high school. Each session would last for two hours, and include both physical activity and wellness. Our first event focused on safety and heart rate. We had an interprofessional discussion on the topic of “pushing too hard”. Initially, we thought of instructing participants to exercise gradually to prevent excessive soreness. However, we discovered that this is a controversial area in the physical therapy realm where they advocate emphasizing injury prevention over delayed muscle soreness. The structure of our program was to have a quick introduction of the program, followed by a group warm up with dynamic stretching, a circuit, a group cool down, and a wellness topic with healthy snacks. 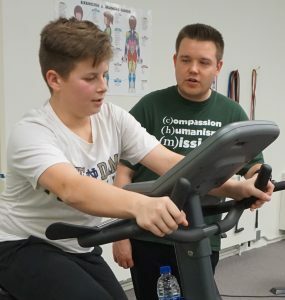 The circuit included six 10-minute stations which emphasized safety and proper form, as well as teaching participants how to take and understand their heart rate. In our first session, we had four participants ranging from 6th through 11th grade. We also had 8 volunteers, consisting of physical therapy and medical students. The scholarship provided us the ability to provide dinner during an orientation for the volunteers and several supplies during the event, including water bottles, health snacks, and pencils and notebook so participants could log their heart rates. We intend to use the remaining funds for the rest of the planned sessions (currently planned through January). These are planning on being held once a month, but may increase depending on participant and volunteer excitement. We are also working to create a sustainable model where this could be readily passed down to each class of medical students in Flint. This opportunity allowed us to better understand the barriers to starting interprofessional, community programming. We navigated scheduling issues and partnership expectations, and were able to successfully hold our first clinic this November. We are excited to watch the clinic grow as we expand our fundraising efforts and continue to improve the program’s structure.